I’m originally from Istanbul, but I’ve been living in Germany for 15 years. I came here to study, but I discovered music in my mid-20s and realized that it gave me a sense of purpose unlike anything that I’d done before. Eventually, I made it possible to live only through working in the music industry. I DJed all the parties in Essen and the surrounding cities during my first 10 years living here, but when my friend Arnesa was given the opportunity to take over the Goethebunker space in 2012, I saw my opportunity to really establish a home base where I could invite artists and curate music as a resident. 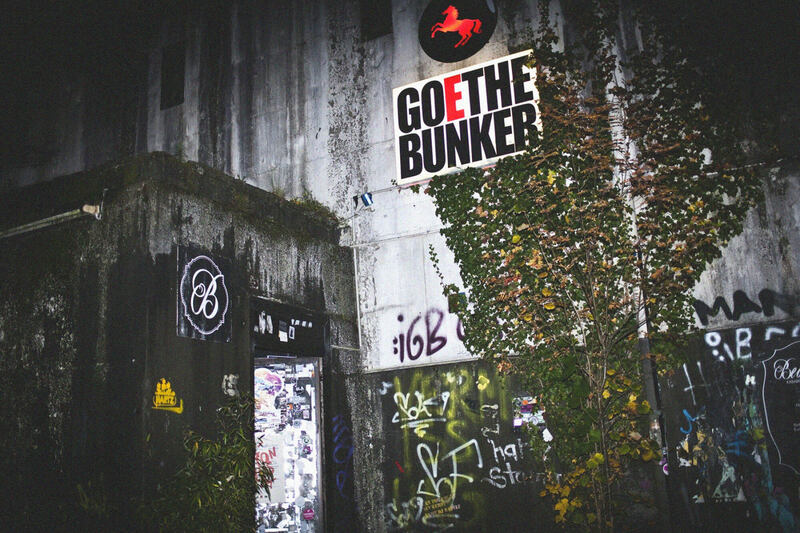 At that time, I was actually thinking about moving somewhere with a more dynamic music scene, but I thought, “Someone is giving me a platform to be a musical curator, and the club has a lot of potential.” Goethebunker is one of the main reasons why I still live in Essen. If the club had closed, I would have moved away. I now manage all of the bookings and promotion. There are two phases to the club’s history: it was a store for horse accessories before it was a club, and before that, it was an air-raid shelter from the Second World War. It’s above ground, but neighbors can’t hear it because it has walls that are about 1.5 meters thick. There’s a really compact sound in the club, and the capacity is small: it only fits 300 people on the main floor. What makes it so special is that it really is a bunker, and it feels like that inside. It’s very dark and raw, which are distinctive characteristics that you can’t change. You can’t go in and say, “Oh, I want to make a really fancy club out of this place,” because it wouldn’t work. And I think that’s a good thing. The space is very authentic. Goethebunker’s immediate area—Rüttenscheid—isn’t central to the main area where all of the bars, cafés and restaurants are. That, coupled with the fact that Essen itself only has a population of about 600,000 people, means that the guests who attend are coming specifically for the club and didn’t just run into it on the street. The club’s location makes it very much a part of the creative scene beyond the city’s borders, and a lot of people from surrounding cities attend our parties. There’s a strong community surrounding Bunkernacht, and a lot of people who come regularly have been coming for years. Even the owner, Arnesa, is there every weekend to work behind the bar to say “hello” to everyone. This sense of community is really important for us, especially in a city whose scene isn’t as big as in Hamburg, Munich or even Cologne. We’re really thankful that enough people come and support us for the thing we love. I think we’ve remained consistently popular because our philosophy has always been to create an inclusive space. We don’t have a door policy at Bunkernacht—we just let everyone in who wants to come, and we let them decide for themselves whether they like it or not. We also don’t have a music policy. I’d rather invite artists who play a diverse sound than artists who just try to play “Berghain techno,” for example. I want DJs to explore different styles like house, disco, more experimental music or whatever makes them feel the most comfortable. That being said, one night the music can be straight, focused techno, and the next night it can be all house. Or it can be a combination of both. I really try to keep the musical direction open. The truth is, Essen’s inclusiveness has made me care a lot less about scenes in cities like Berlin, where nightlife seems to be based on trend-following tourists. That’s the total opposite of the atmosphere at Goethebunker. Our parties are about good music, a good sound system and an open-minded crowd. We might not be as commercially successful as the clubs in Berlin, but OK. Capitalism is centered around the idea that your value is based on how much money you bring in, but I think that your value lies in what you’re doing. As a DJ, this means being able to play what you like and having people react positively to it, which is more important than having a club filled with people who don’t understand the music at all. For me, at least, the satisfaction of the soul is more important than material things. I think most people in our society forget that. Roman Flügel will perform at Goethebunker this weekend on February 4 for the Telekom Electronic Beats Clubnight. Find more information here.